It is a reliable occurrence now: every time we have a cold event here in the United States, two public conversations begin, both of which deploy the term “polar vortex.” Those who are suspicious of the reality of climate change and persist in calling it “global warming” argue that these polar vortex-driven cold events are evidence the warming is fake news. Other people know polar sea ice is vanishing while these polar vortex events seem to be multiplying and amplifying. The climate, people say, is just getting out of control. But new developments in climate research are steadily making more sense of the changes we are witnessing. Yutian Wu, an associate research professor at Lamont-Doherty Earth Observatoryand a Center for Climate and Life Fellow, is a scientist adding to our understanding of these events. Wu is a climate modeler. Climate data can show a correlation between climate events and their ostensible drivers. On the other hand, climate models, because they rely on the laws of physics to recreate the behavior of the environment, can establish a causal relationship between observed environmental change and climate events. Wu and her colleagues have shown that decreases in sea ice in the Barents and Kara seas (BKS) north of western Russia cause a reduction in atmospheric pressure gradient that extends up into the stratosphere. This reduces the strength of the jet stream that encircles the basin and allows polar air to break out of the Arctic basin and descend on Eurasia and the North Atlantic. Because of this research, it may be possible to predict when an especially cold winter is coming to northern Europe and Asia. Given the human and economic costs of very cold weather, this is science with measurable value. The ring-shaped zone of abrupt atmospheric-pressure change that encircles the perimeter of the Arctic Ocean and usually keeps the cold air in is called the Arctic Oscillation (AO). In its so-called positive phase, it forms an effective barrier, keeping Arctic air masses over the Arctic basin. In its negative phase, westerly winds in the high mid-latitudes are weaker and allow the Arctic cold to penetrate southward. The phenomenon is called an oscillation because the system alternates between positive and negative phases. 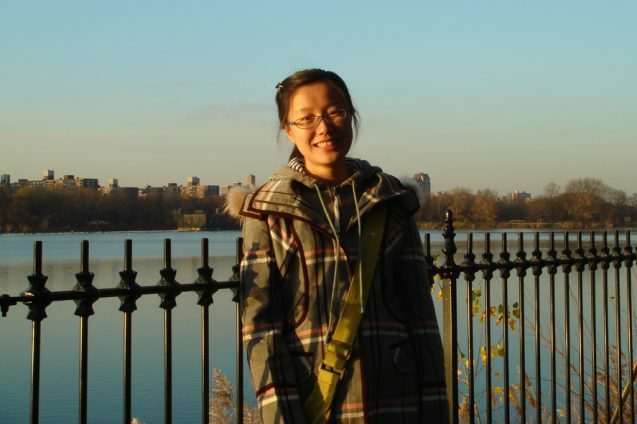 Wu and her research community discovered that the decrease in sea ice cover in the BKS region and the associated warming of the overlying atmosphere by the heat released from the exposed ocean weakens the stratospheric polar vortex, and the “downward influence” from the stratosphere to the troposphere weakens the retaining-wall properties of the AO. Previous studies looked at changes in the AO without assessing the effect on mid-latitude weather extremes. Wu and her colleagues also found that while the greatest loss of Arctic sea ice occurs during the late autumn and early winter, the effects on the AO and mid-latitude weather extremes persist through the winter because of the long timescale of the stratospheric processes. Their modeling studies have the potential to improve seasonal prediction of mid-latitude cold events over the North Atlantic and Eurasia. The NAO is in a positive phase when the pressure gradient between the Icelandic Low and the Azores High is large, which causes the westerly winds to be strong. As Wu explained it, the strong westerlies penetrate the subarctic and drive the warm Gulf Stream/North Atlantic Drift surface water into that region, melting the sea ice in the Barents and Kara seas. But this produces a negative feedback — the weakening of the westerlies and the AO — that flips the NAO into a negative phase. The latter is associated with especially cold winters in both northwest Europe and the northeastern United States, as well as fierce winter rain storms in the Mediterranean. Wu and De found that it was important to incorporate a significant portion of the stratosphere in their model in order to recreate cold-air outbreaks in response to sea-ice decline. Wu is still in her early 30s. She has many more model experiments to perform to test her hypotheses and to her research. She completed her Ph.D. at Columbia in 2011, held positions at NYU and Purdue University, and then returned to Columbia in 2017 to work at Lamont. “We have quite a large group of climate scientists to study the impacts of climate change, and it is a very collaborative environment that includes research scientists, post docs, and graduate students,” Wu said. This post was first published by the Center for Climate and Life, a research initiative based at Lamont-Doherty Earth Observatory.